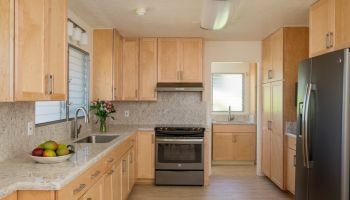 Having had their hearts set on remodeling their closed-in kitchen for quite some time, one Hawaii Kai husband-and-wife team finally decided to take action. 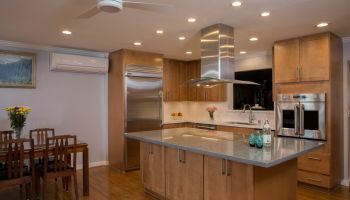 Enlisting the help of their professional designer friend, the couple was able to put together their dream plans, and brought these desires to local Hawaii kitchen remodeler and designer, Homeowners Design Center, in order to make their dream a reality. Knocking down a wall standing where the cooktop now is made this dream kitchen remodel happen. Utilizing open shelving helped to create an even greater openness to the kitchen. Adding to the kitchen remodel’s impressive aesthetics are its cutting edge Viking brand appliances—a flattop cookstove, as well as a fridge and dishwasher featuring matching panels to the cabinetry—which the couple chose themselves, and which Homeowners Design Center worked to incorporate into an effortless flow within the rest of the scope of the project. The homeowners kept the existing oak wood flooring by sanding it down and adding a new finish. The rainforest granite perfectly complements the overall soft and welcome tones of the kitchen. When all was said and done, the couple could not have been more pleased with the results of their kitchen remodel-a project which Omoto is equally proud of. “It’s the dream kitchen they’ve always wanted,” she smiles. To see more projects by kitchen remodeler Homeowners Design Center, or to learn how they can help you with your next home or kitchen project, just click on the company's name or on any of the photos above.